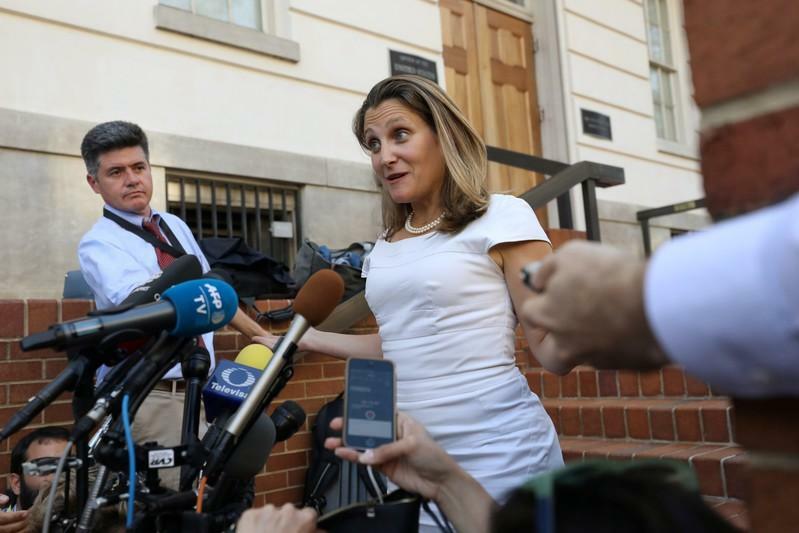 WASHINGTON (Reuters) - Canadian Foreign Minister Chrystia Freeland said on Wednesday she remained optimistic about progress on negotiations with the United States over a revamp of the North American Free Trade Agreement, but said there was a "huge amount of work to do." "We have had a good meeting yesterday. We've had another good meeting today," Freeland told reporters after emerging from a meeting with U.S. Trade Representative Robert Lighthizer. "I continue to be encouraged by (the) conversations we're having and the progress that we're making." Still, she added: "When it comes to specific issues, we have a huge amount of work to do."